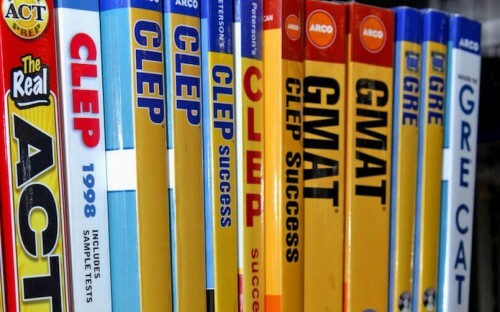 Home > News > Gmat > GMAT Vs GRE: Does Your Choice Of Business School Admission Test Matter? I get a lot of questions from students who are thinking about business school and the biggest hurdle they see starting out is the admissions test: when should they take it? What's a good score? How do they know if they should re-take the test? And most importantly, does it matter whether they take the GMAT or the GRE? In terms of acceptance: no. The vast majority of business schools – and all of the top MBA programs – now accept both the GRE and the GMAT. While there used to be a significant (if mostly unspoken) bias toward the GMAT on the part of admissions committees, that is waning somewhat as the GRE grows in popularity. There is still a significant difference in how many students are taking each test in order to apply to business school. Worldwide, the GMAT was taken 261,248 times in 2016. Of those exams, 65% (156,748) were taken by students intending to apply for an MBA program. By contrast, while the GRE was taken by 584,677 examinees for the testing period running from July 2015 to June 2016, there were only 37,504 examinees, 6% of overall test-takers, who indicated an interest in business as their graduate field of study. What really matters the most when it comes to business school applications is how well you're able to do on a given test. Test scores are a very important part of your MBA application, but they aren't considered in a vacuum. There is no blanket answer to “Should you take the GMAT or the GRE when you're applying for an MBA?” The answer will be different for every applicant, depending on their background and capabilities. So, when clients ask me if it really matters which admissions test they take, I tell them of course it does – a little bit. If you're trying to decide whether you should focus on the GRE or the GMAT for business school admissions, there are really just two primary considerations: which test will you be able to score the highest on, and which test will best balance out the other strengths and weaknesses of your application package? The first question is relatively easy to answer, if a bit time consuming: take a full-length practice version of each test. Try to make the practice test as reflective of the real exam as possible, in terms of timing, environment, etc. Both ETS and GMAC offer free downloadable software that allows you to take full-length practice versions of the GRE and GMAT, respectively. Taking these practice tests will give you a sense of not just what your baseline score is on each test, but it will also let you get a feel for the question types and topics covered on each exam, so you know where you would need to direct your studying in order to do well. For the second question, you need to consider your MBA application as a whole: What was your undergrad major? How strong was your GPA? What industry is most of your work experience in? What are your post-MBA goals? Consider asking a friend to look at your application, and give you a sense of what they feel your aptitudes are based on your background. Quantitative skills, and solid exposure to higher-level math, finance, or economics, are often valued by MBA admissions committees. If you don't have a very strong quant background, you'll want to use your admissions test to show that you've got the skills to keep up if you're admitted to business school. Conversely, if you have a lot of experience in a pure math or a highly technical field, or if you come from a non-English-speaking background, you'll want to use your admissions test to show the admissions committee that you can communicate effectively with both classmates and employees, and that you will be able to persuasively convey your ideas in writing. No matter which test you choose, you need to commit to it. Don't put off studying because you assume it will go fine. Invest the time – and if you need additional assistance, the money for tutoring or prep classes – into doing well on the GMAT or the GRE, and it will pay off when you do apply to business school. Chioma Isiadinso is an education entrepreneur and co-founder/CEO of EXPARTUS, the first MBA admissions consulting firm to integrate personal branding into every aspect of the MBA admissions process. She's also a former Harvard Business School admissions officer and the author of the Best Business Schools' Admissions Secrets. Chioma publishes on the topics of personal branding, leadership development and business school admissions for college students, young professionals, entrepreneurs and executives.